Ghosts of the North East is born. In the summer of 2002 Rob and Andy take the short drive north into the heart of Northumberland in search of spooks during the castle's normal opening hours at one of the most haunted castles on Planet Earth. The Castle Keep in the centre of Newcastle is the oldest building in the city. Back in 2002 it was barely linked with ghosts at all, whereas nowadays there are investigations there almost weekly. Andy and I spoke with the staff who told us about the mythical Poppy Girl, a tall male figure seen crossing the Great Hall wearing a top hat, and screams echoing from the eerie Gallery. Walkworth Castle has seen literally thousands of people killed and tortured here, so you'd expect it to have its fair share of ghosts. Our first ever ghost hunt after dark. In conjunction with Alan Robson's Night Owls on Metro Radio. We headed to Talkin Tarn in the dead of night on the scariest night of the year - Halloween. Only weeks before a bloody apparition was witnessed walking from the murky depths in broad daylight. After our initial visit to the Castle Keep during daylight hours, the castle undoubtedly had more to offer and I was itching to get inside those ancient walls after dark. After months of planning that night is finally here, and alongside Andy and John, we would conduct one of the first ever investigations at the Castle Keep. Winter's Gibbet in Northumberland is an awesome sight, standing over 15 foot tall, it's a permanent reminder of a grisly incident here just over 200 years ago. An innocent old lady was killed for her belongings, and the brutal punishment dealt out to her killer William Winter. His ghost is often seen here, but would we see him tonight? Not strictly a ghost hunt as such, the team is off on a monster hunt! 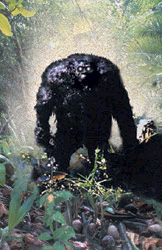 Over the previous 18 months there have been dozens of sightings of a huge hairy bigfoot type creature at Bolam Lake County Park. A team of professional monster hunters spent a week here and saw it for themselves. The chance of coming face to face with the beast described by witnesses as being ten foot tall with red glowing eyes and teeth like barn doors filled us all with fear, but none the less, Bolam Lake here we come. 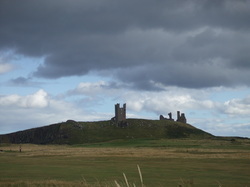 The largest castle in the county of Northumberland, Dunstanburgh Castle has seen more than its fair share of death. It position is so remote thats its over a mile from the safety and comfort of a car park, streetlights or houses. It it a location with a rich history of ghostly tales and the GOTNE boys couldn't wait to see what it had to offer. 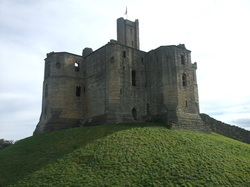 Bamburgh Castle is world famous and experts believe that it may once have been home of Sir Lancelot. It has a history drenched in blood, as well as countless paranormal sightings. Sadly Bamburgh Castle forbid ghost hunts, lucky for us that the beach and dunes that the magnificent castle overlooks are said to be just as haunted, if not more so. Little is known of the hauntings at Edlingham Castle, in fact it's never been investigated properly before. We went there with low expectations, but we were foolish to do so, what we experienced will stay with us for our lifetime. Cresswell Tower, sadly a sorry sight these days, once the home of royalty. The tower is a now an overgrown, ruin, forgotten at the back of a caravan park which bears the tower's name. This downturn in fortune hasn't put the ghosts off, as a young lady is seen throwing herself from the top of the tower, and the surrounding woodland is said to be home to the ghosts of Vikings. With memories still fresh of the happenings at Edlingham Castle only a few nights earlier, we were drawn back for a second visit to try and reveal more of just what is happening at Edlingham. Understandably Harry took some persuading to come along for the return journey. Battlefields are a massively overlooked location by almost all paranormal investigators. When you try to imagine the bloodshed, the agony, the horror, how many thousands of people died here? You would imagine if there are such things as ghosts we may well find them at Otterburn Battle Site. Find out here what happened when Rob and the boys visited on a freezing cold, wet October night. Halloween, the night of the year where it's believed the dead are said to return and wander the Earth once again, amongst the living. Where better then to spend the night in a haunted graveyard with a couple of hundred dead souls as my only company, as tonight Rob will be spending the night in St John's Graveyard alone. Flodden Field is the infamous battle where just shy of 500 years ago 14,00 English and Scottish men were killed in battle, the bloodiest battle ever on British soil. To this very day ghost battles are seen re-entacted at the battle site, locals hear the sounds of battle, the unmistakable sounds of clashing swords, so common that it's almost accepted as the norm. I recently received an email from one of my 'fans', who said they live but a stone's throw from Easby Abbey, they've heard of it's supposed ghosts and would love to read about the GOTNE boys carrying out a ghost hunt there. Cooks Wood has a well known story but is rarely visited, and certainly hasn't been investigated in recent history. However pick up any book about the region's hauntings and most will contain the story of Cooks Wood's Red Lady. I decided to spend Halloween here to see if she would grace us with her presence. This is it. 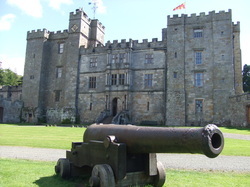 Chillingham Castle need's no introduction, and tonight is the investigation that the last three years have been building up towards. Ghosts of the North East spend a freezing cold December night at Northumberland's most haunted. 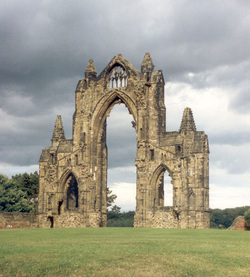 Gisborough Priory was ruined many years ago and very little of the original structure remains. Legend says a black monk haunts the remains of the priory to this day. As the sun slowly falls from the sky and the darkness closes in around us, would we see the ghostly monk? Tonight we're going to conduct a ghost hunt at a hairdressers. A hairdressers?!? I can almost hear you exclaim through the virtual airwaves. That's right, Elite Hair Design in Birtley might look like an ordinary hairdressers, but after dark it becomes a real 'hair raising' prospect; angry ex owners, the playful specter of a young girl, and inexplicable black shadow creatures are all reported to reside here. Dunstanburgh Castle receives another visit. This will be the fourth investigation at the magnificent old ruin and will it deliver as it has done previously? With the imminent release of Ghostly Northumberland, the lads head to Dunstanburgh once more in search if Sir Guy the Seeker. With Halloween just around the corner, the lads head to the Victoria Tunnel; a subterranean wagonway far below the streets of Newcastle which was originally constructed to transport coal down to the Tyne. It closed in 1860 and was abandoned for many decades until World War II when it was converted into a air raid shelter to protect 9000 people within Newcastle.